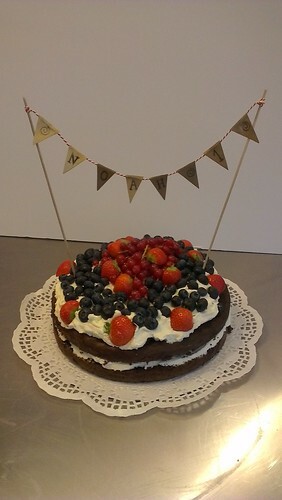 Healthy Spelt Chocolate Party Cake, a photo by CAKE Amsterdam - Cakes by ZOBOT on Flickr. Young kids and especially Healthy Moms approve! Chocolate Banana Spelt cake made with maple sugar with a whipped cream/marscapone filling with sliced bananas and topped with fresh fruit! Not all cakes have to be decorated and covered in sugar to look good right!? !